A combination of garlic and a subtle blend of herbs and spices. Net wt. 6.5 oz. Ship wt. 1.5 lb. 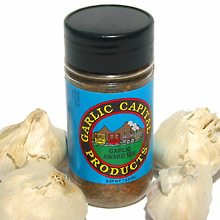 11/2/2010 – If I order garlic from you, can you guarantee me that it will be real California garlic? Thanks!